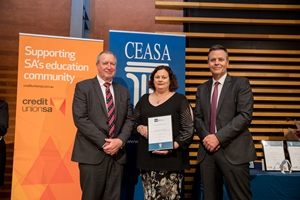 Congratulations to Tricia Richman who won the TRB Induction and Mentoring Early Careers Award at the CEASA Awards on World Teachers Day. The award is given to an individual who has made a significant difference to early career teachers and aims to highlight the importance of educators working with early career teachers. Nominees for the award were: Ruth Flaherty, Dominic Hopps, Miriam Parsons, Michiel Pretorius and Alison Robertson. 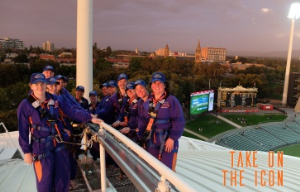 Our eleven RoofClimb winners braved the weather and celebrated World Teachers Day on the roof of Adelaide Oval where they were rewarded with some breathtaking views of Adelaide. The winning teachers were: Catherine Crosbie, Nicholas Klar, Amelia Neumeister, Victoria Harwood, Stefanie Edmondson, Nicola Capon, Margaret Urdanoff, Adele Nightingale, Christiana Schammer, Louise Fielke and Kate Frost. Did you notice? Adelaide Oval lit up in the TRB’s colours of blue and green on World Teachers Day to say thank you to all our teachers! Watch our World Teachers Day video here. Expressions of Interest are invited from registered teachers who would like to attend the Humanities and Social Sciences SA 2018 conference – teachers F-12 including pre-service. The conference is being held at UniSA Magill campus on Saturday 24 & Sunday 25 February. The TRB has ten sponsorships available for early career and country teachers. Applications close Friday 2 February. Find out more here. Office of the eSafety Commissioner Teacher Essential PD Program, three hours of professional learning through webinar participation. Find out more here. The PASCO Professional Learning Workshop with Doug Bail from Ciderhouse Tech will focus on a variety of activities around the use and implementation of PASCO technology into the curriculum and the classroom. Thursday 30 November from 9:00am-4:00pm, Westminster School, Room 312 in the Carter Laboratories wing. RSVP to Meipin Wang: mwang@westminster.sa.edu.au. The Ronald McDonald Learning Program can support schools by providing a free, one-hour professional development session, EDMedTM. The session helps participants gain a better understanding of the effects of chronic illness and treatments on student learning and wellbeing, how to keep children connected while they are away from school, and the teaching and learning approaches specific to the needs of children with serious health conditions. Each participant receives a free resource book and certificate of attendance. For more information, please see the website here. Book an EDMedTM presentation at your school by calling Verity on 8267 6922. Little Lessons is holding a seminar with Madhavi Nawana Parker Practical ways to set your class up for success in 2018 to be happier and more resilient – for educators and health professionals (working with children from K-7). Wednesday 29 November 4:00pm – 6:30pm at the Hewett Centre, 28 Kingfisher Drive, Hewett. Cost $79.50 plus booking fee. To find out more or to book click here. Ideal Learning has extended its online professional learning offer to all South Australian teachers. You can purchase 30 hours of self-paced online professional learning in Neuroeducation for a total price of $99+GST. This offer has now been extended to the end of Term 4. If you are a TRT who is not connected to a school please use your home address and write ‘SA TRB’ for your place of employment and principal. Teachers don't have to be an Ideal Learning member, or a school member. This is a standalone special offer for South Australian teachers who click the link below. If you have previously purchased one of these courses, the rest of the courses in the list will be added to those you have already purchased. To find out more click here. Early Years Number Sense, 9:00am-3:00pm on Thursday 18 January 2018 at the Education Development Centre, 4 Milner Street, Hindmarsh. Cost $135, find out more here. An Introduction to Natural Maths, 9:00am-3:00pm on Tuesday 23 January 2018 at the Education Development Centre, 4 Milner Street, Hindmarsh. Cost $135, find out more here.